Trekking up to the library to revise for exams or work on coursework hand-ins takes a lot of effort for both the mind and body. Hopefully our free fitness and meditation classes, combined with extra places to study across campus has helped a little, but we understand that having something to look forward to after acts as great motivation to see you through the next couple of weeks. 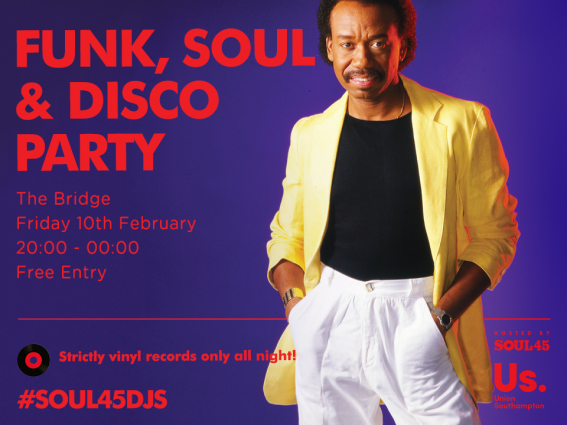 That’s why we’ve organised for soul and funk lovers, the legendary Soul 45 DJs to make a return to The Bridge for an evening of classic vinyl. There are so many chart club nights, we thought we would hold something a little bit different. So scrap the laptops, CDs and ipods, this is taking it back to basics, with great music played on 7-inch. And what’s more, is it’s FREE! So what are you waiting for?! Join us on Friday 10 February between 20:00-00:00 at The Bridge. See who else is going on our official Facebook event.